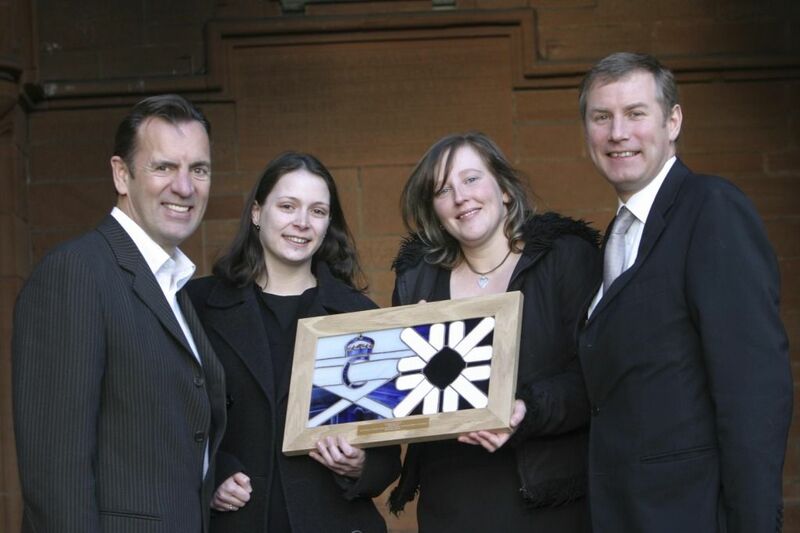 Here are a few of the famous clients that have visited our wee shop over the years. CLICK ON THE POLAROID for big pictures! 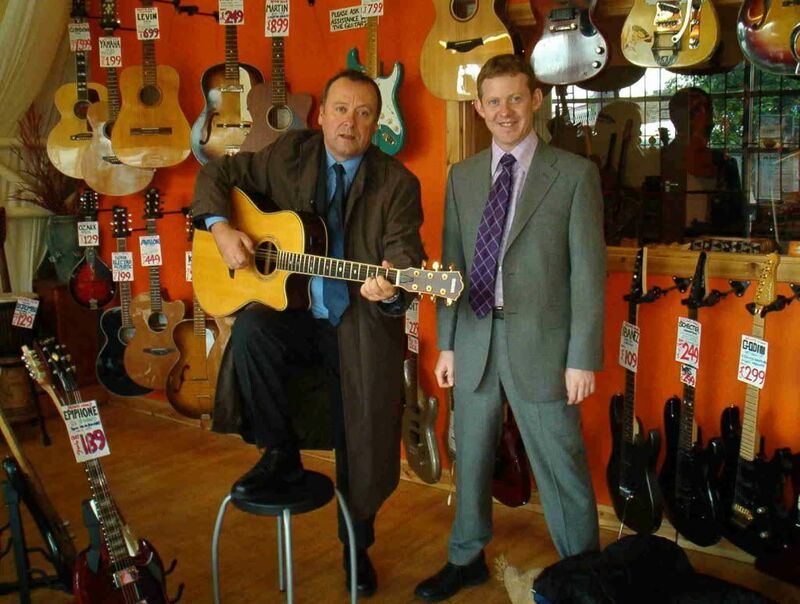 There's a lot of "murderrrs" filmed in Merchant City so Alex and Colin are regular song singers at Strung Out. Mr Alex Norton pops in whenever he is in Glasgow to see what gems he can pick up for himself and also and his musician son! CLICK here if you don't know about the TV drama that is our Taggart! Lead singer/guitarist with Glasgow band Franz Ferdinand. Delighted with the repair on his archtop guitar which was in 2 pieces when he brought it in - see more photos down the bottom of this page! CLICK to listen to this talented and unique Glasgow band! 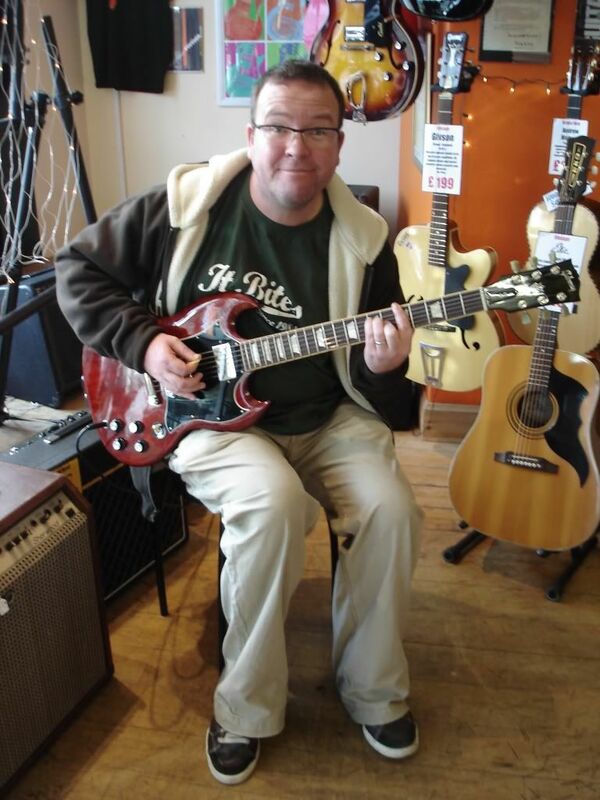 Scottish Star of Still Game, Chewin'' The Fat and all round actor Paul Riley is also an avid rocker and ACDC SG fan! He dropped his guitar in for a set up to make sure it plays it's best! Check out Paul and all his talents by CLICKING here. Errors are a local band now gone worldwide as they deserve to - their music is a vast mix of digital and analogue sounds and instruments - clever guys and lovely too! 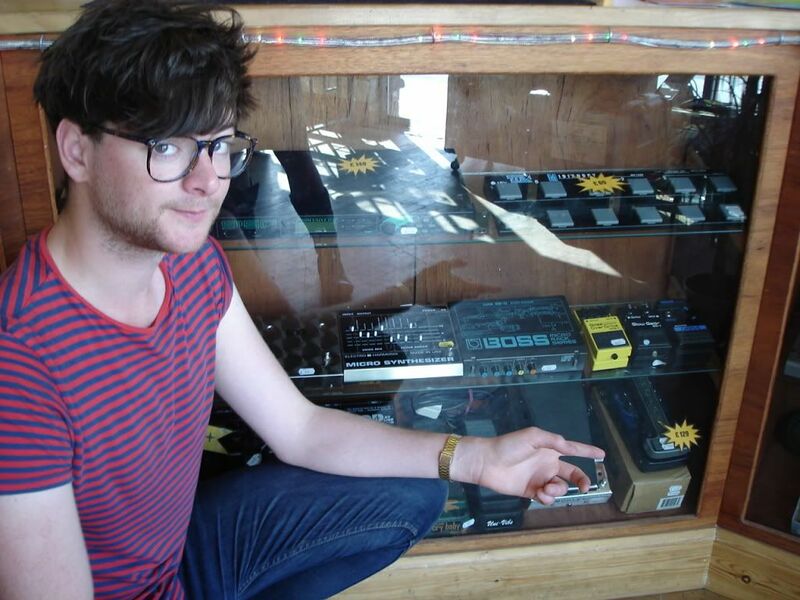 Stephen has a passion for all things musical but always goes straight to our effects cabinet. CLICK here to listen to their amazing electronica and more! One of the best drummers of our modern era, Paul Thomson is most known for playing drums but can rock a guitar as well! 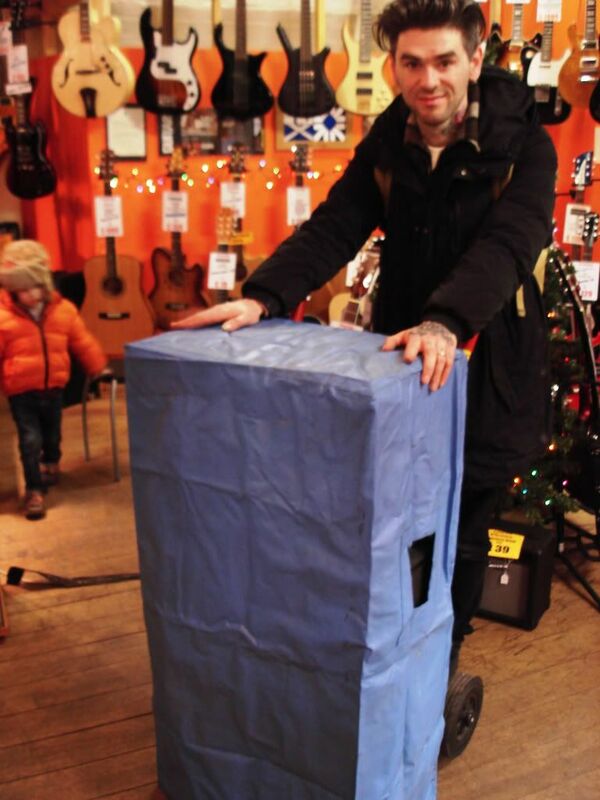 Here he is taking home a vintage Selmer combo for those raw valve tones of the 1970's! Hear some fine tunes from Franz Ferdinand by CLICKING here. 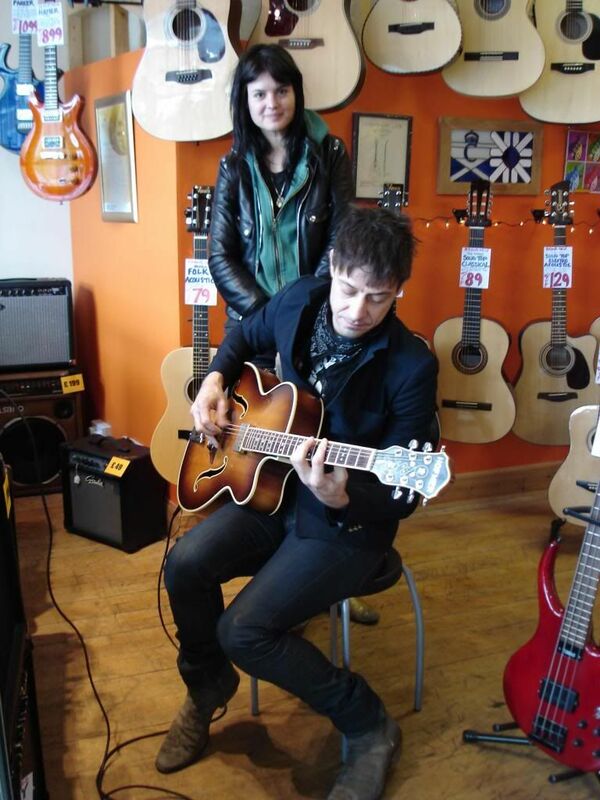 Jamie Hince and Alison Mossheart of the revered 2 piece bank the KIlls surprised us one fine Saturday! 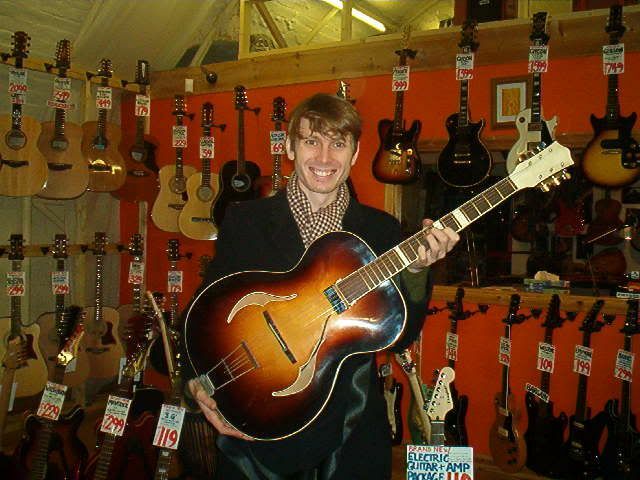 All our staff are huge Kills fans and they are always playing in our workshop so when they came in to buy a Hofner President archtop guitar we were delighted! To have a listen to them, CLICK here. Stuart is a founding member of post-rock behemoths MOGWAI - they have been Scottish music heroes producing quality albums since 1995 and so are one of the most prolific bands we have had the privilige to serve! Check them out on myspace by CLICKING here. 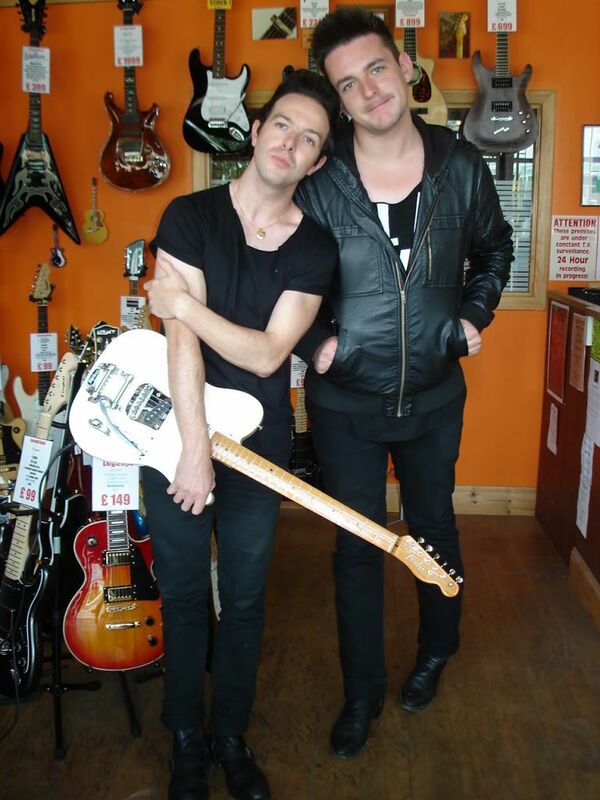 James Allan and Rab Allan from the local indie rock outfit GLASVEGAS are friendly young men and thankful to us for fitting a Bigsby to their beloved Tele! 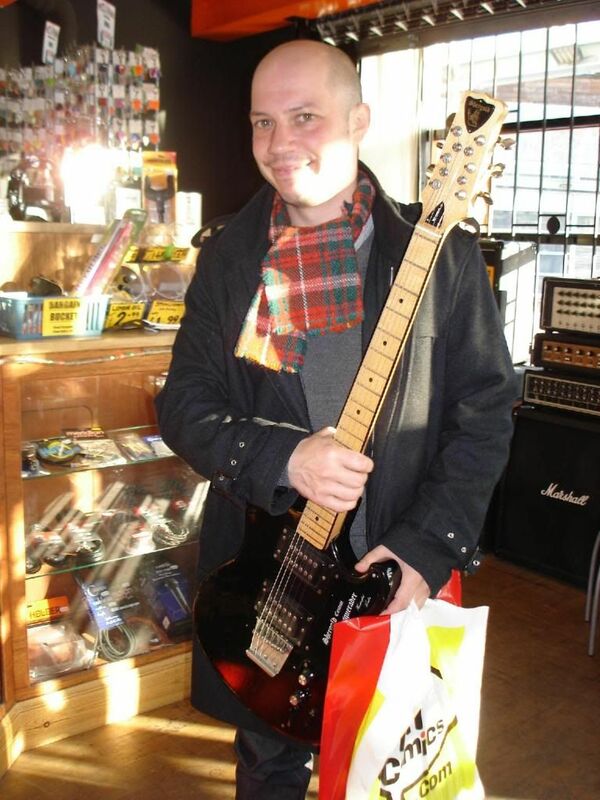 James also purchased an amazing St Andrews Cross Les Paul so show round the world! CLICK here to listen to visit the Glasvegas myspace page. 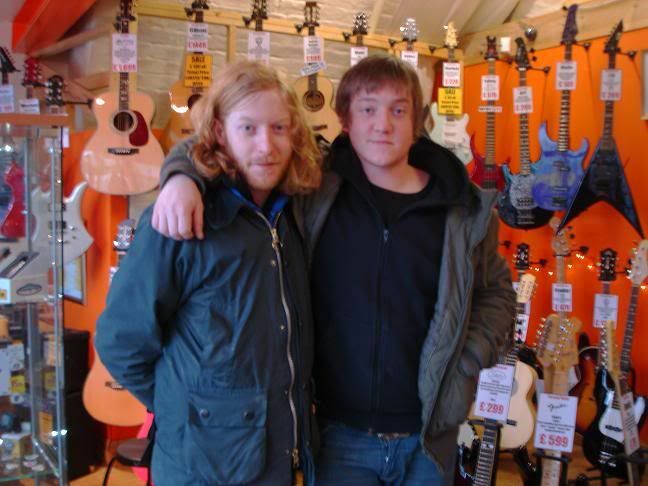 James Johnstone, Biffy's amazing bass player and Adam (bass tech) from BIFFY CLYRO came into our shop with an amazing 15 guitars and 4 amps to get ready for their current tour... We worked late alot that week and it was an honour and a pleasure! CLICK here to experience the Biffy on myspace! 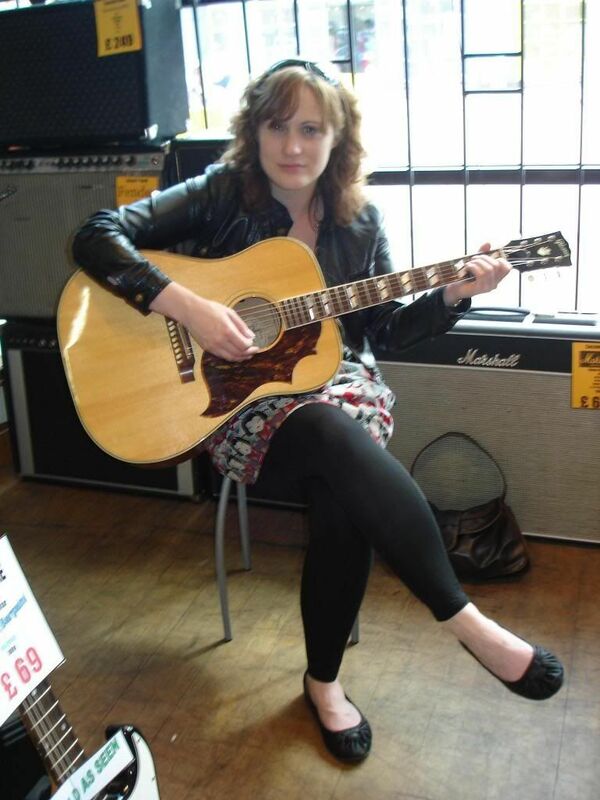 Caroline is a fantastic Edinburgh-based singer/songwriter - she's also a huge guitar fan! CLICK here to listen to some of her superbly produced songs. Prolific Scots actor who has been in more well known films than we can mention! 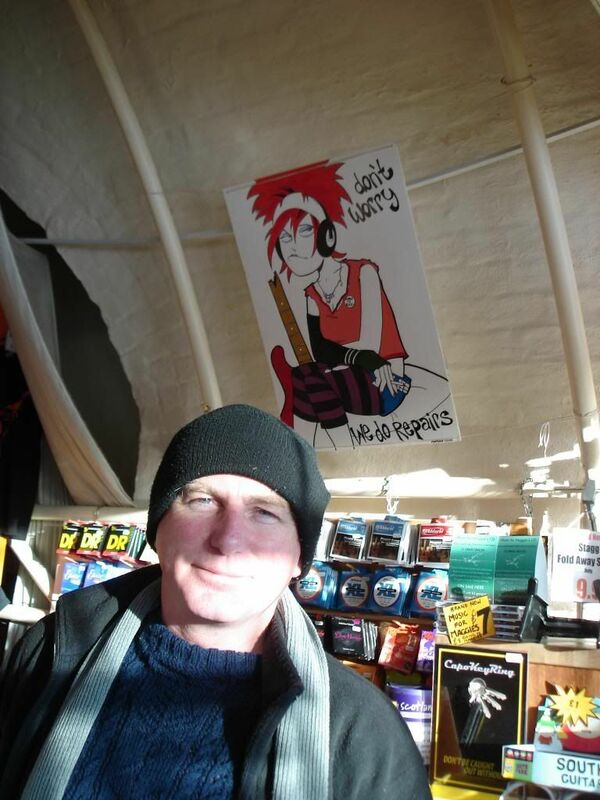 He and his son popped in to get their musical supplies. CLICK here to check out Gary's impressive list of movies! 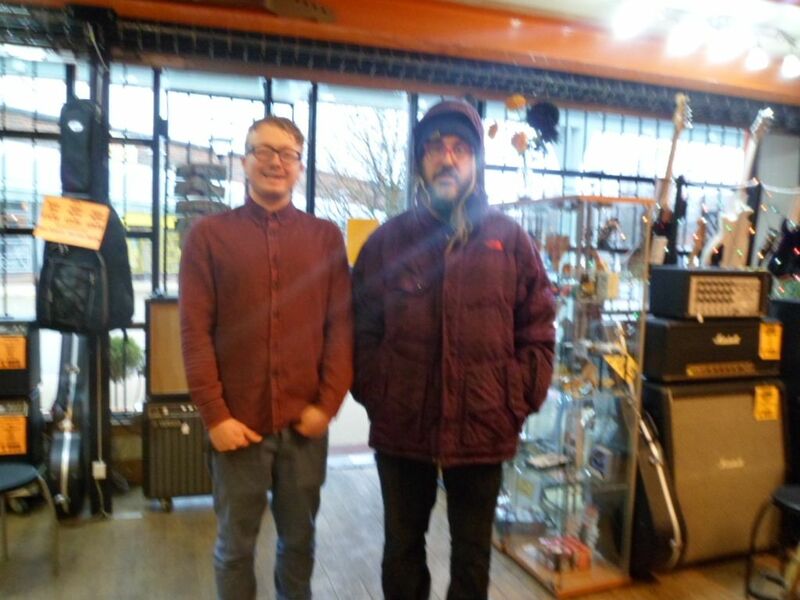 A very chuffed staff member, Calum, with American musician J. Mascis who is quite unsure of our weather! He is also ranked SPIN'S 5th greatest guitarist of all time! Check out his rock hair and find out more about him and Dinosaur Jr by CLICKING here. 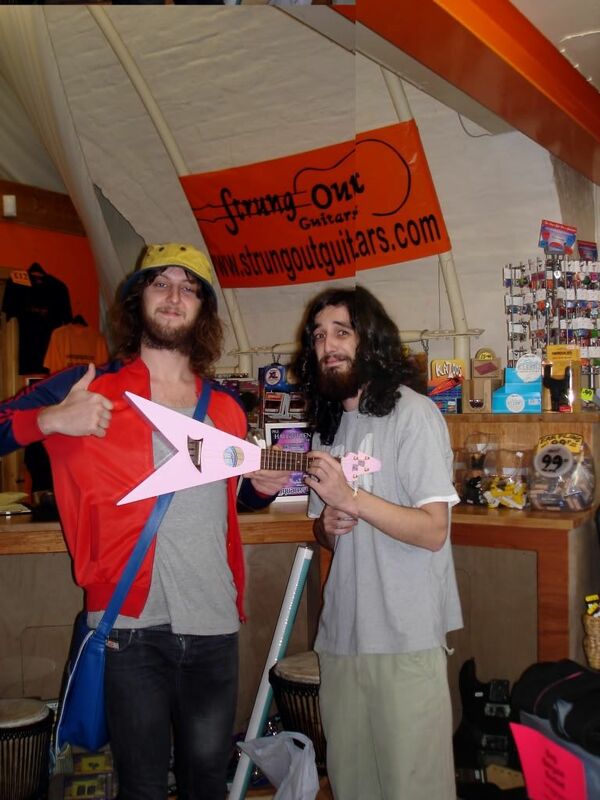 Mince Fratelli and his drum tech Mark pop in to jam out on a baby pink Flying V uke - very rock and roll! CLICK here to sample some Frat music! 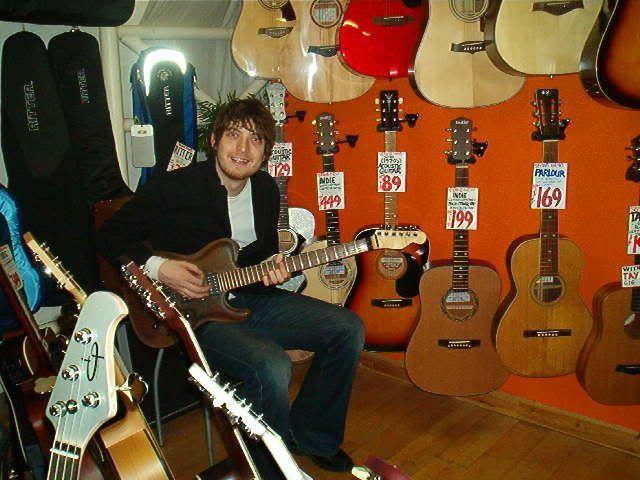 Nathan Connolly was in to buy a guitar that himself and the other Snow Patrol guys signed and gave to charity - good on them! 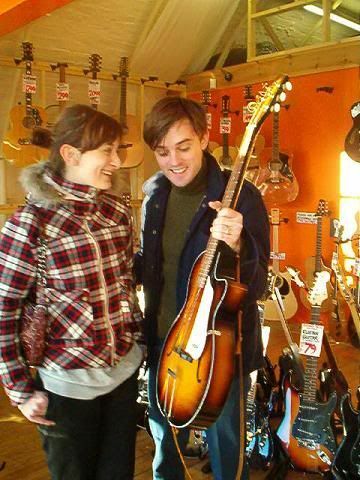 When picking up his repaired guitar, Nick from Franz Ferdinand and his wife Manuela took the time to sign a guitar we were putting up for auction for Cash For Kids! 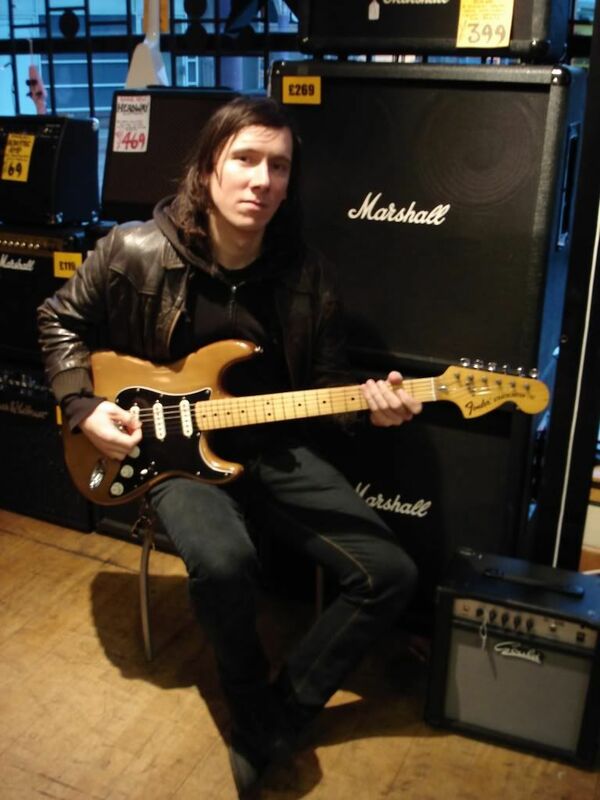 Scott Paterson of Sons & Daughters is a regular visitor and we always have some a pedal or two to feed Scott's passion for rare and unusual effects! 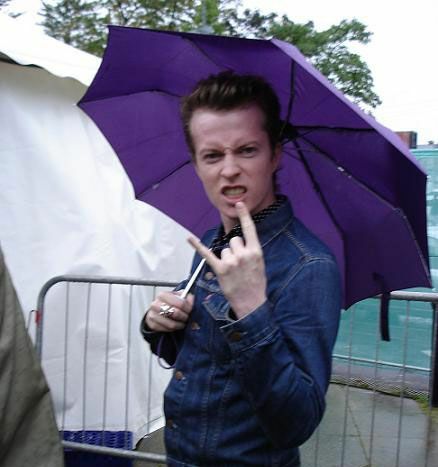 This is Scott before going on stage with Franz Ferdinand at King's Court Festival - just outside our shop. Listen to this unique and rockin band by CLICKING here. Allan plays a real mean guitar with rockers Idlewild, heavy De Salvo and the riff mammoths that are Holy Mountain - he is a busy and talented man! We feed his passion for Marshalls and vintage Strats and SG's! 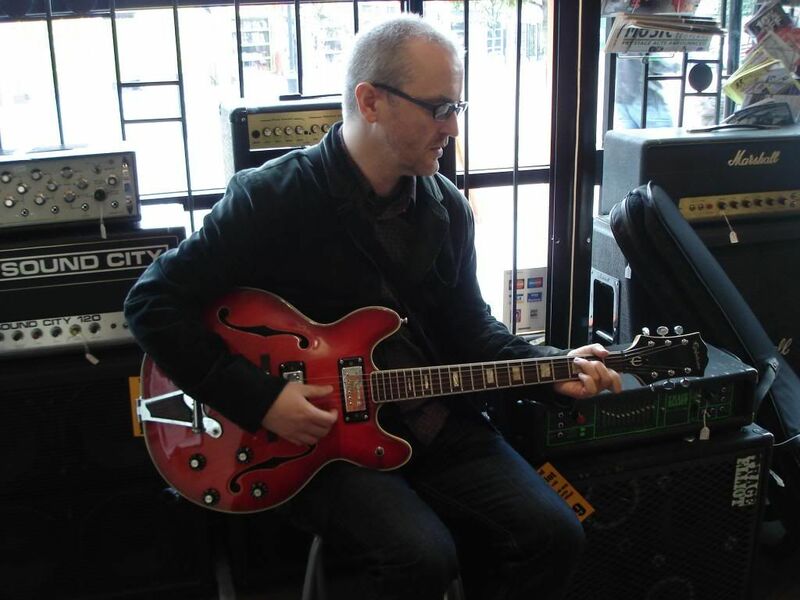 Eugene is a highly regarded Glasgow musician who is most known for his work in the VASELINES but does amazing solo work also. When Eugene dug his old 70's Epiphone out the cupboard to get it back on the gig circuit, he brought it into Strung Out for the full works. 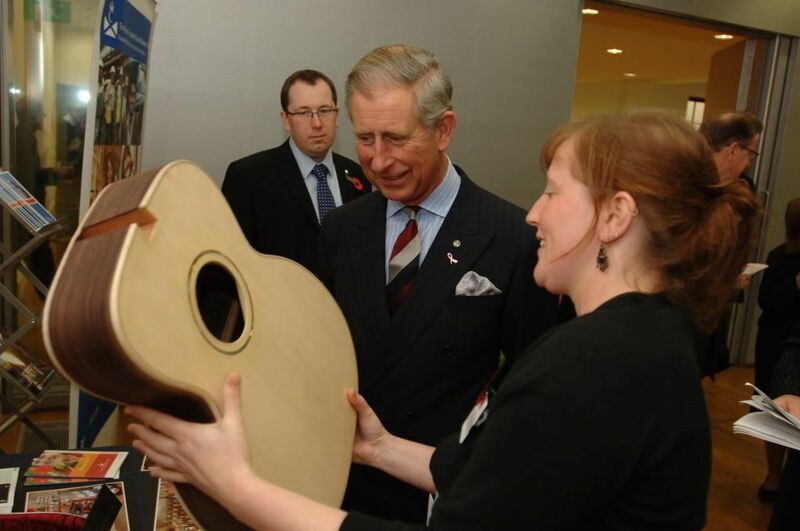 Strung Out Guitars would not be in exitstence without the Princes Trust Charities so Paula and Louise both got to thank him. 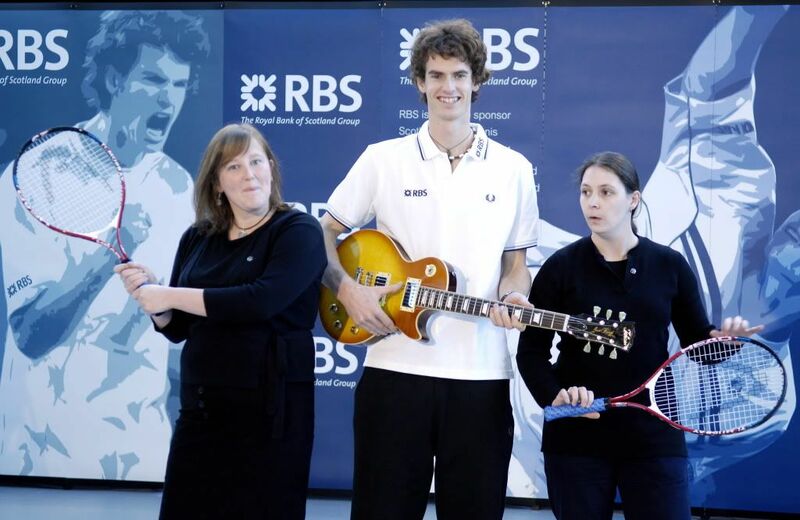 Andy swaps his racket for a guitar at an RBS photoshoot in the Science Centre! He had no problems smiling for that! Click here to support him and "like" Andy! Michelle is a valiant supporter of entrepreneurs and had a good chat to Louise about business ideas at a photoshoot at the SECC! 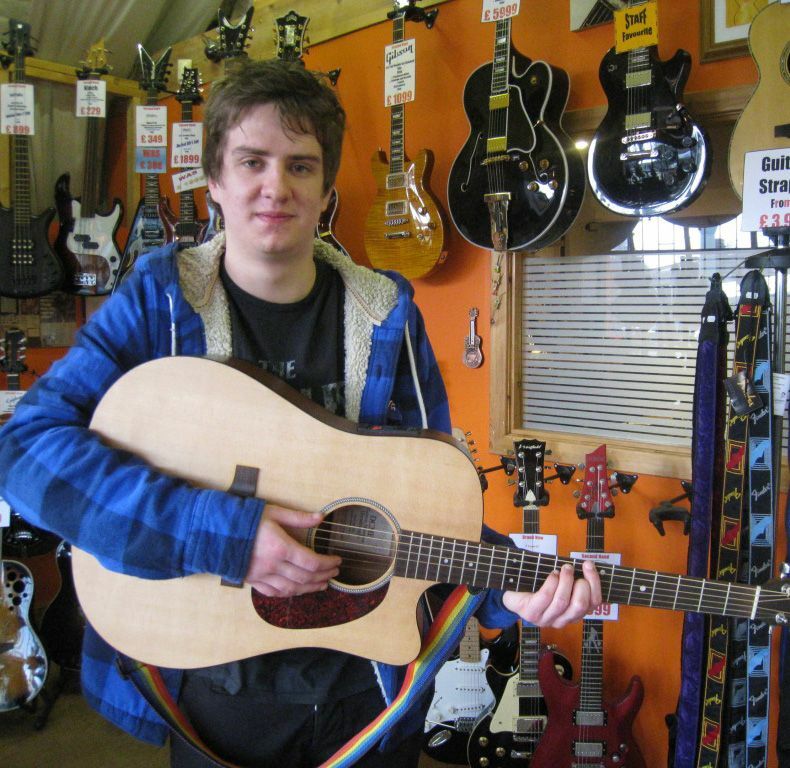 Homegrown contemporary singer/songwriter Tommy Reilly popped in for a refurb to his beloved Taylor acoustic! Even played us a wee tune. CLICK here to listen to some amazing tunes by Tommy. 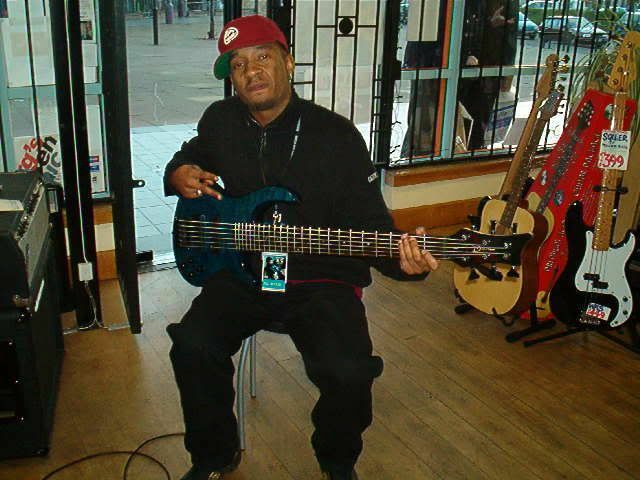 Needing an emergency bass repair before his Carling Academy gig, Snoop Doggy Dawgs main man Chooky was rescued by our repair team- what a dude! Very impressive on that 5 string bass is Antone "Chooky" Caldwell. 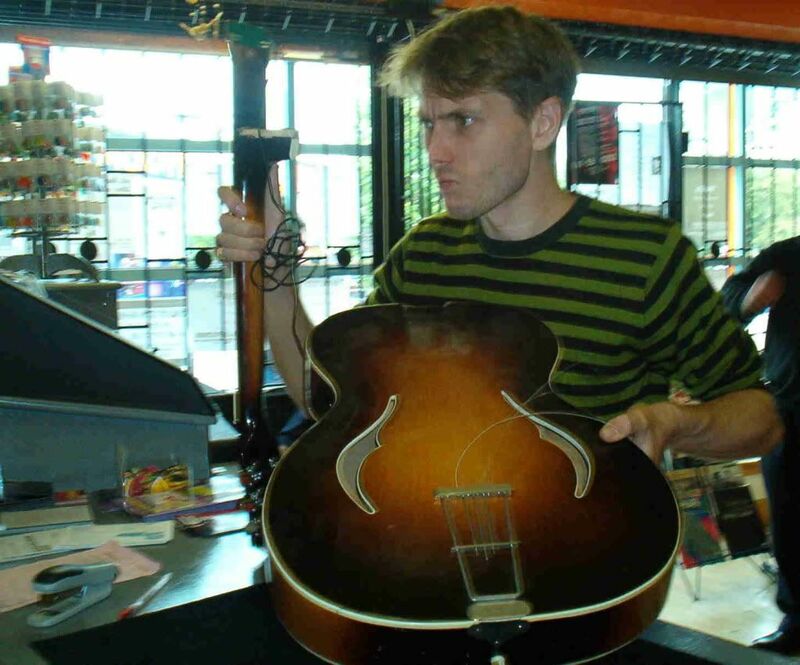 Alex's archtop took a nasty knock and ended up in 2 pieces! Luckily it was all repairable and we put it all back together for him! 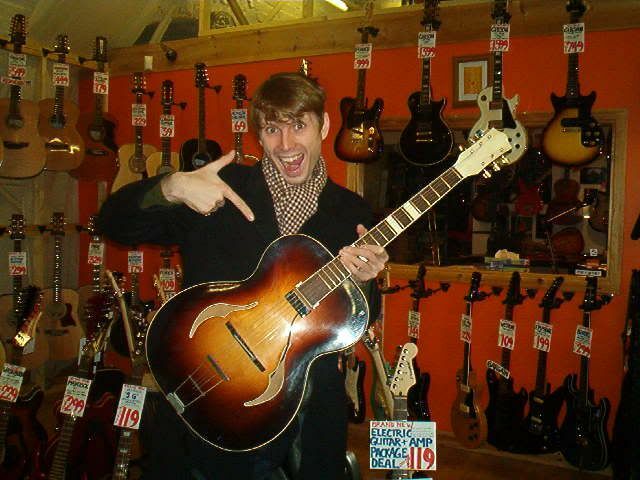 Alex is reunited with his 50's archtop that had lain in bits for years. He was chuffed to bits and even played us a bit of Franz song "Walk Away' to celebrate! 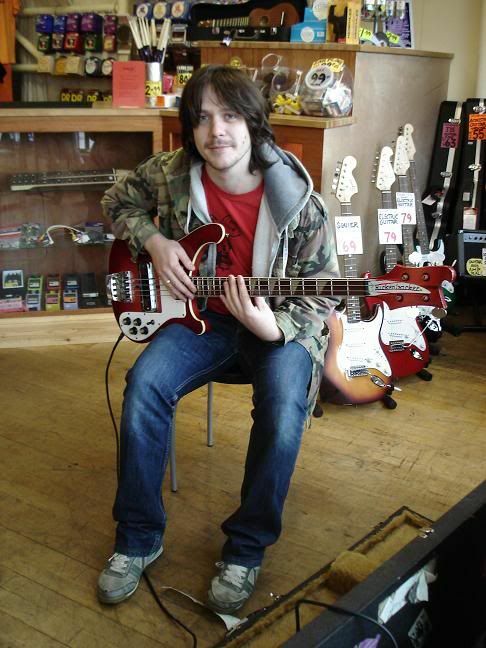 Gareth - bassist of prolific Scots rockers Idlewild! Like us, he's a big fan of old Rickenbacker and Fender basses. 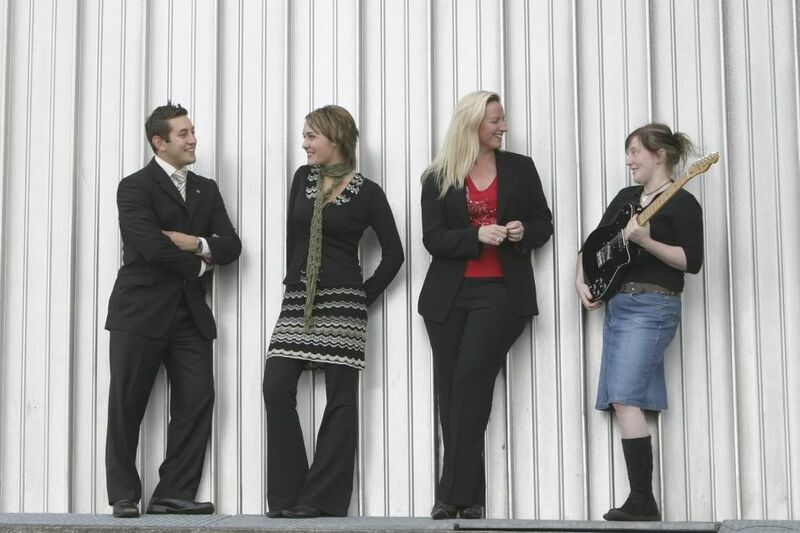 Gareth also played in bands such as Astrid and The Reindeer Section! Morning politics presenter Declan is also an avid supporter of small self-employed businesses. 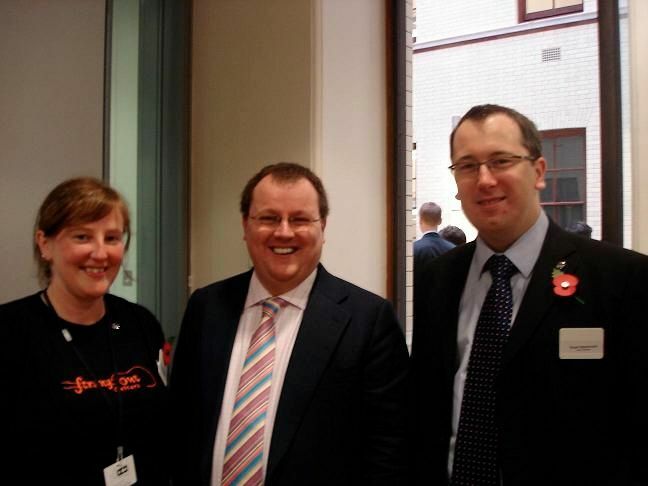 Louise and Paula were lucky enough to receive some pearls of wisdom when meeting him in London.